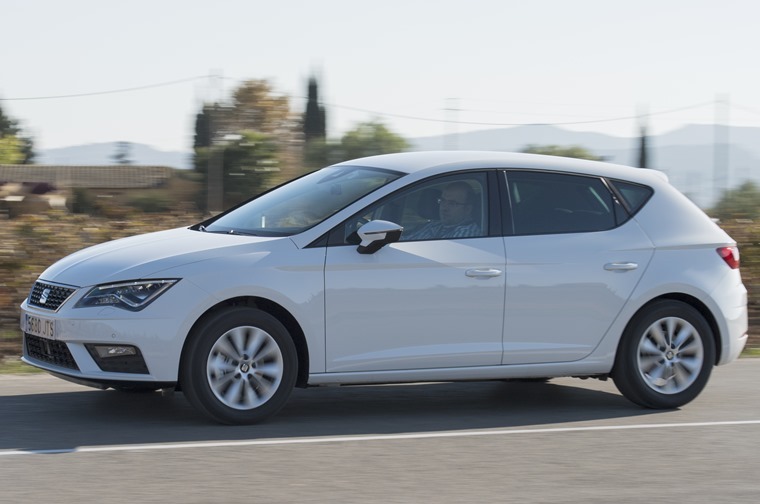 Stronger, safer, sportier and more technically connected than ever before, the Seat Leon remains a great lease choice and a viable alternative to absolutely anything in the segment. 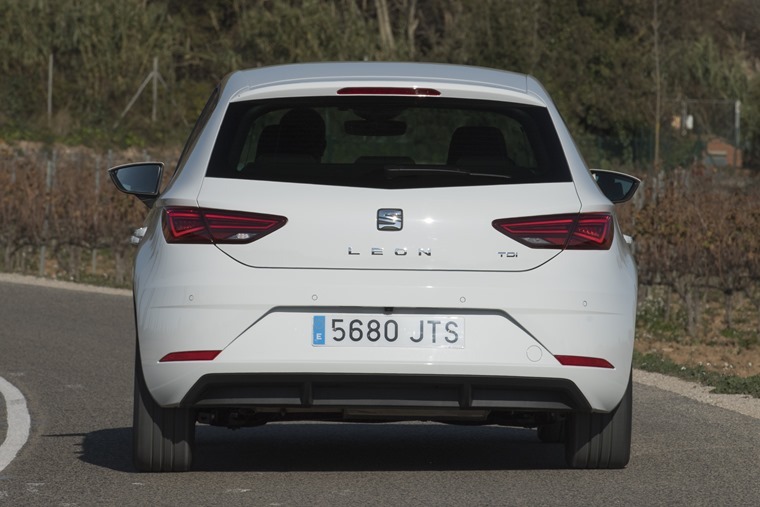 It’s hard to imagine the Seat line up without the Leon, but the vital part of the Spanish firm’s range was only introduced towards the end of the last millennium. On top of that, its third iteration has been around for a few years now so it’s time for a quick update to keep it fresh. That means there’s a subtle facelift. Very subtle. Without putting old and new together, you would be forgiven for not recognising what’s changed. As the world’s hardest spot-the-difference, look closely and you’ll find there are new LED daytime running lights, more LEDs at the rear of the car, and a front grille that’s a little bit bigger. There are more noticeable changes inside the car, where the cabin has been tidied up nicely. The handbrake has now gone, replaced by an electronic switch - what you lose in handbrake turn ability you do gain in extra storage space in between the seats - while ambient lighting provides a warm atmosphere. 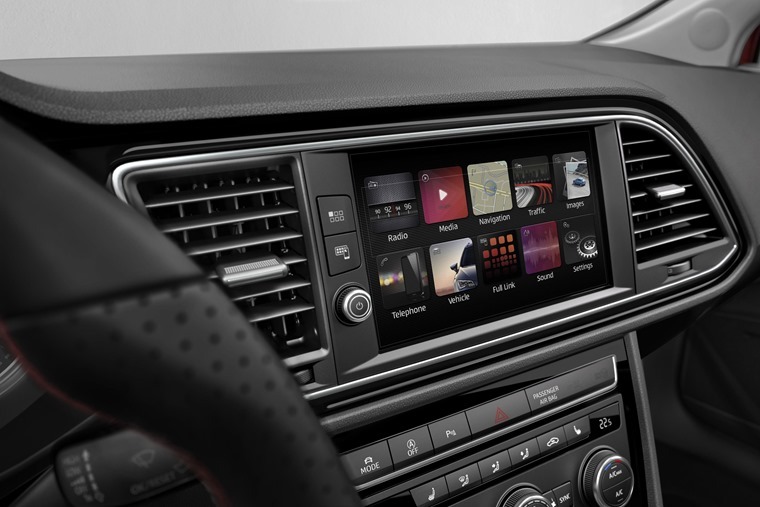 The old digital screen has been replaced by a full-colour 8in infotainment screen (apart from in the base ‘S’ spec models) and that sits above a ‘connectivity box’ that includes USB connections, a phone signal booster and wireless charging for suitably equipped mobile phones. It’s undoubtedly the technology where Seat has focussed its efforts, with virtually everything from the previous model either replaced or improved upon such as cameras and satellite navigation, as well as new technology being added such as Android Auto and Apple CarPlay support, as well as traffic sign recognition. The Leon no longer feels second best to [...] the Volkswagen Golf. The perceived quality of the car has been improved upon too, with new materials covering touch points around the car and more attention being paid to how the car feels rather than just how well it’s bolted together. Find some twisty roads and the firm suspension pays dividends, generating a driving experience that will keep you pushing on for longer than you probably ought to. The result is that the Leon no longer feels second best to its German sibling, the Volkswagen Golf. There’s a near-perfect driving position in the front, plenty of room for all other passengers, and a boot that’s every bit as big as that on the Golf, making it a perfectly fair comparison. The Leon differentiates itself from the Golf in the way that it drives. Despite sharing much of the underpinnings with each other, the Seat gets a sportier setup that encourages more enthusiastic driving. This test model comes fitted with a 1.6-litre diesel engine that’s smooth and refined and, with a small boost from the previous generation Leon from 110PS to 115PS, it’s powerful enough to provide enough thrills for most drivers. That means 0-62mh is dealt with in just 9.8 seconds, which doesn’t sound earth shatteringly quick, but it masks the constant surge of torque that seems to continue propelling the Leon until you eventually run out of revs. It’s powerful enough to provide enough thrills for most drivers. A manual five-speed gearbox is perhaps a ratio short of ideal, but the wide power band makes it perfectly suitable. Yes, the larger 2.0-litre engine adds a tad more oomph to the car, but you’ll sacrifice official economy of 70.6mpg and low-tax CO2 emissions of 106g/km if you chase the extra performance. 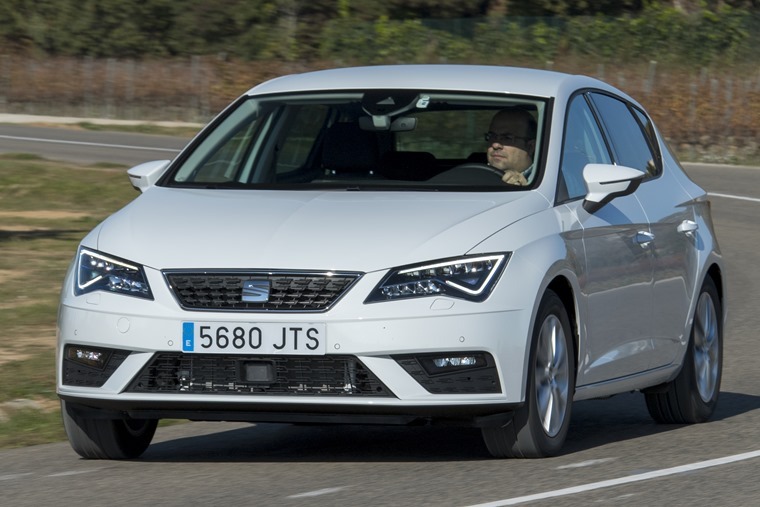 The Seat Leon ends up being a viable alternative to absolutely anything in the segment. Ride quality is fine, although it gets a little fidgety as the wheel size increases on sportier models. Find some twisty roads and the firm suspension pays dividends, generating a driving experience that will keep you pushing on for longer than you probably ought to. However, it’s a shame that there’s not much feedback through the steering wheel, but that’s a common theme among sensible family cars, including that pesky Golf. The Leon has inherited the Golf’s reputation for solidity and safety, too. A five-star crash safety rating from EuroNCAP in 2012 has been backed up by annual testing to further validate the result, so there’s no risk of buying something that was once considered safe but is now just an also-ran. Each Leon also comes equipped with seven airbags and autonomous emergency braking, a system that sees the car take control of the brakes when it’s certain that you’ve given up and are definitely going to hit something solid. An optional safety pack adds tiredness recognition, high beam assist and lane assist for just an extra £120. Bringing it all together shows that the new Leon, while looking remarkably similar to the outgoing model, really has had a much deeper refresh than might appear to be the case. This makes it stronger, safer, and more technically connected than ever before. It’s also a far sportier option than some of the other similar sized hatchbacks available, while the diesel version adds excellent economy alongside the excellent levels of equipment as a bonus. 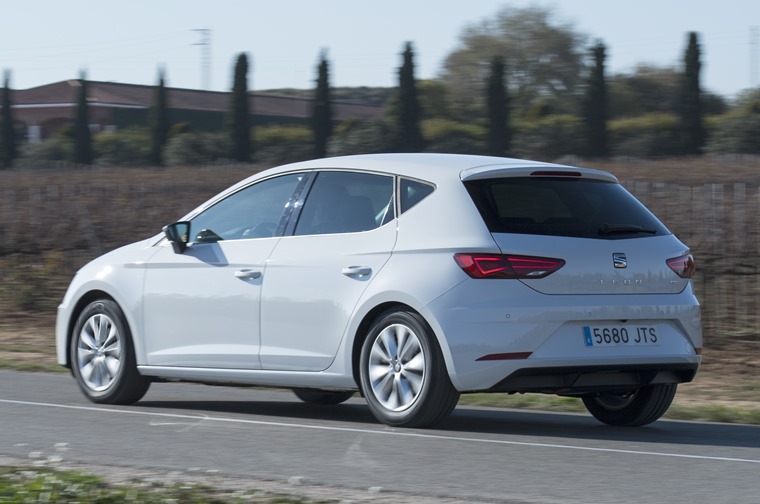 Add in a dash of Spanish style to all of these positives and the Seat Leon ends up being a viable alternative to absolutely anything in the segment.